I'd be pretty curious to know how many hours of precious life (or text bubbles) my friends and I have whittled away obsessing over our birth control habits—questions about whether or not the pill can cause weight gain, if it impacts the heaviness of our flow, and what exactly happens to our body when we miss a dose. Whoops. Missing a birth control pill isn't ideal, but hey, we're only human, and it happens. Chances are, if you're on the pill, you've forgotten to take your daily dose at least once, and chances are you've also experienced some confusion, concern, or even panic after the fact. When it comes to our periods, pregnancy, and birth control, there's a lot of hearsay, and sometimes getting correct information (if you're not consulting your gyno directly) can be more difficult than we'd hope. So we thought we'd set the record straight. What happens physiologically in our bodies if we skip a pill, how does it impact the chances for contraception, and what's a trusted doctor's recommended protocol if or when it happens? Ahead, we're tackling all that and more. Keep scrolling! So what happens on a physical level when we miss a pill? First things first. According to Harpreet Brar, MD, FACOG, a board-certified ob-gyn at Detroit Medical Center's Hutzel Women's Hospital, it's important to take the pill every day to ensure maximum effectiveness. Yes, we're kind of touching on birth control 101 here, but there's a reason we're instructed to take the pill every day, and missed pills can, potentially, lead to contraception failure and other potential side effects. 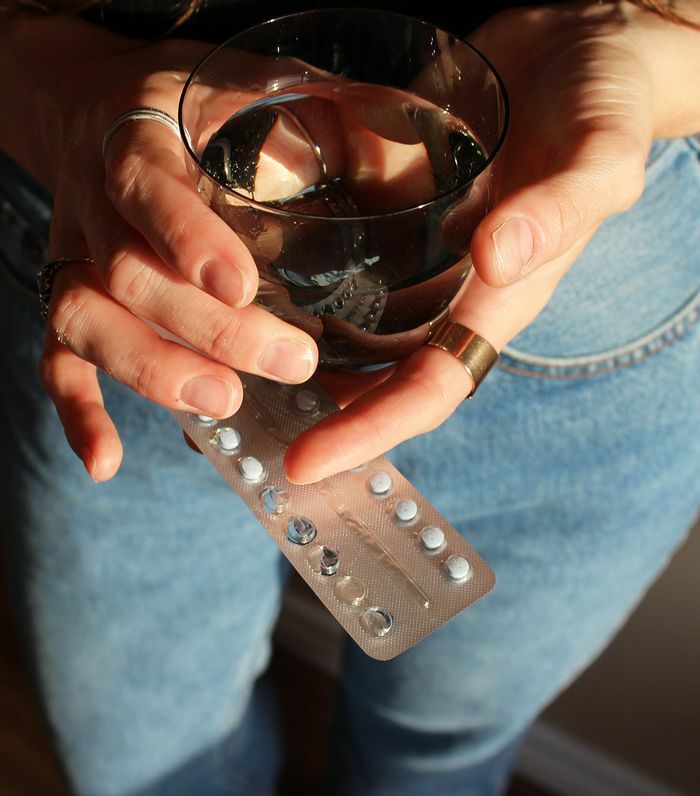 "The oral contraceptive pill is usually a combination of two hormones that are designed to prevent the pregnancy hormone by inhibiting the release of hormones such as the luteinizing (LH) and the follicle-stimulating hormone (FSH) from the pituitary gland to the brain," explains Omnia M. Samra-Latif Estafan of Nelly De Vuyst/BioFemme. "Together, these two hormones prepare a woman for pregnancy by developing the egg and prepping the uterus to be a suitable environment for the pregnancy." By taking the pill every day, it's consistently and effectively able to suppress the release of certain hormones, which will help prevent pregnancy. Thus, skipping a pill can cause these hormones to "wake up," as Samra-Latif Estafan says, which will cause a slight lapse in protection. Additionally, she says breakthrough bleeding, nausea, weight gain/bloating, headaches, and mood changes could be other potential side effects. "Generally, one missed pill will not decrease the effectiveness of the pill pack, and no backup contraception is needed," shares Brar. "However, if two or more consecutive pills are missed in the pack, the remainder of the pills should definitely be taken (set an alarm! ), and a backup method of birth control should be used for the next seven days to prevent pregnancy." It's also important to remember that not all oral contraceptives are the same, so it's a good idea to check the information that comes with your prescription in addition to discussing a customized game plan with your gyno. They'll be familiar with your specific type of birth control and your health history and therefore better able to accurately advise on the best course of action should you skip a pill. "If you skip a pill, definitely do not panic," Samra-Latif Estafan assures. "Take the missed pill as soon as you remember, and continue with the remainder of the pack as normally scheduled, even if it means you end up taking two pills that day." "How effective a birth control pill is is referred to as typical and perfect use," notes Samra-Latif Estafan. Typical use, she says, refers to inconsistent use and when we may miss a pill here or there, and the failure of protection results in roughly nine out of 100 women becoming pregnant during the first year of use. "Perfect use describes taking the pill correctly and consistently every time, and the failure of protection dramatically decreased to roughly one out of 100 becoming pregnant," she confirms. Of course, there's also the situation to consider when you're purposely wanting to go off the pill. And, FYI, you shouldn't just quit cold turkey since stopping mid-pack can lead to menstrual irregularities the first few months after you've stopped taking the pill. "To stop using a birth control pill, I advise patients to finish the pack to get your period on time," Samra-Latif Estafan tells us. "Stopping mid-pack can lead to menstrual irregularities the first few months until your cycle kicks in on its own." As Brar shares, once a woman has stopped the pill, most have a return of menses and fertility within 90 days." Next up, the state of reproductive rights in 2019, according to a Planned Parenthood rep.